The most fascinating way to make fire: A blow to the piston will ignite tinder, which has been inserted into the fire piston. The compression heats up the air to such a high degree that tinder will ignite. A diesel engine operates in the same manner. Our fire piston combines a fascinating physical principle with highest quality and versatility. 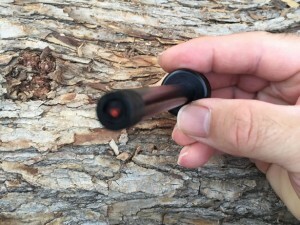 At the bottom the fire piston is equipped with a completely waterproof (IPX8) capsule for tinder storage, the detachable handle contains a ferrocerium rod as an alternative method for making fire. In case of emergencies you will always have at least one reliable source of fire available. The piston and the vent are perfectly sealed with double gaskets. The piston gaskets are made ​​of high quality nitrile rubber and are therefore extremely resistant to abrasion, heat and cold and are compatible with all lubricants. The Bushcraft Essentials Fire Piston is a device that ignites tinder by rapidly compressing air to the point of superheating it using the same principle as a diesel engine. But the BE Fire Piston is not only a device for igniting tinder, it is a complete waterproof fire kit packed in a small slender package. The BE Fire Piston is made in Germany from a precision CNC machined aluminum alloy selected for its exceptional strength and durability. The lower-end of the fire piston combustion chamber is covered by a removable cap sealed with an nitrile rubber o-ring that seconds as a vacuum release valve. It also provides easy access to the combustion chamber for periodic cleaning and maintenance. The other end of the combustion chamber cap is an IPX8 waterproof compartment sized perfectly for storing a small amount of tinder like BE Char Cord or any other form of char material. The storage area comes with about 2″ of Char Cord wrapped inside, but it is certainly large enough to hold 6″ of 1/4″ diameter Char Cord which should easily be enough to start around 24 fires. Char Cord is very similar to char cloth, catching fire from smallest spark. However, Char Cord is much less delicate and tends to burn much more efficiently. This allows it to smolder a lot longer providing more time to work with your tinder bundle. Char Cord is made in Germany from rope that has been manufactured in a German ropery. If you need additional Char Cord, you can purchase it directly from Bushcraft Essentials in 50 centimeter lengths. It is always a good idea to have at least one reliable backup fire source handy. Uniquely integrated into to the design of the BE Fire Piston, there is a small ferro rod tucked neatly inside the piston rod itself. Simply unscrew the piston handle from the piston rod and there it sits. The piston (or plunger) and combustion chamber are sealed with double o-ring gaskets made ​​from a high-quality nitrile rubber for its exceptional abrasion and temperature resistance and is compatible with most lubricants. Each kit includes 4 replacement gaskets packed in a small ziplock baggie and a small instruction manual with all of the information necessary to use it. The first thing to do is to ready the materials. You will obviously need to have a fire bundle ready so you have a place to drop the ember once it is lit. But you also need to pull out a small piece of Char Cord to ignite in the Fire Piston. Keep in mind that it doesn’t take much… Just a 1/4″ piece is all you need. Second, pull out the piston and lightly lubricate the o-rings with a tiny amount of grease, vaseline, or other rubber lubricant. Opening the valve will release the vacuum holding the piston in the body making it much easier to pull out. However, once the piston has been removed from the combustion chamber, close the valve right away so you don’t forget to close it later. The third step is to insert the Char Cord, char cloth or other highly combustable material into the divot located at the end of the piston rod. This is what will be ignited by the Fire Piston. Simply pack it all in there until it is flush with the end of the piston rod. Use too much or too little and your rate of success will likely suffer. Fourth, insert the piston rod into the combustion chamber just past the o-ring seals and when you are ready, slam the piston into the combustion chamber as fast as possible. Sometimes I slam the piston down on a stump or log if my hands get tired from repeated attempts. The rapid compression superheats the air trapped inside to such a high degree that tinder ignites instantly. The fifth and last step to making a fire with the Bushcraft Essentials Fire Piston must be done immediately after slamming the piston into the combustion chamber. Once the ember is lit, it requires a lot of air and it will quickly run out if left in the chamber for even a short period of time. Once it is burning, simply dump the lit ember onto the tinder bundle and begin to ignite it. I performed this test quite a few times before figuring out the “secret sauce” to successful ignitions with the Char Cord. It does require some practice to get it right with any consistency, and that is one headache that you really don’t want to deal with in the event of an emergency, so you must practice… practice… practice. Bushcraft Essentials’ Fire Piston is a new spin on an ancient technology that has been around for hundreds of years or more… The inclusion of a backup ferro rod and an IPX8 waterproof compartment to store your tinder material was very well thought out and executed. The quality of the materials and precision manufacturing processes used to build the Fire Piston are very high and comfortable to wield. But coming from Germany, that is to be expected. 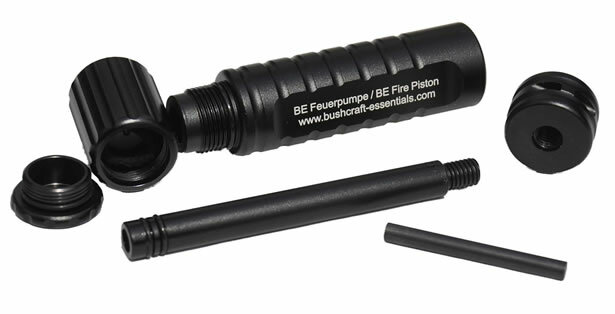 The BE Fire Piston is just another well-designed firemaking toolkit in my survival arsenal. But they are not for everyone… Either you love them, or you hate them. But I think everyone should experience using one at least once. Bushcraft Essentials was founded in 2012 with the vision of the ever-growing Bushcraft-motion (and in general all the people who love in nature are traveling) to give basic and at the same time functional and high-quality equipment at hand. In particular, Bushcraft Essentials has dedicated the theme Hobo stove or multifuel stove. In this area Bushcraft Essentials has gained a world reputation with innovative products and superior quality “Made in Germany” in a very short time. The cooker of Bushcraft Essentials are today on all continents and in more than 50 countries. Our stoves are easy and are distinguished by minimal packing, great versatility and high quality workmanship. All our stove are manufactured exclusively in Germany and manufactured with environmentally friendly processes. We deliberately refrain from our cookers on surface finishes, as these are often harmful to the environment. We also refrain where possible on plastics and pack our products in paper packaging or cotton bags. All products of Bushcraft Essentials are designed for versatility, stability and long life. This circumstance we owe it that our products are highly valued in humans, which depend on reliability and trust our products their lives: Our stove has accompanied expeditions in the Arctic and in deserts and they are in special forces of several countries in the use.